The growing rise in caravan gadgets and gizmos has led to a boom in companies offering their tech-savvy customers something to help their caravan stand out from the crowd, and to make their trip that little bit more special. We’ve highlighted 6 great products to consider adding to your no-doubt growing pile of futuristic caravan gadgets. We all occasionally have difficulty when it comes to parking, and with a caravan in tow this can sometimes be really tricky. Getting yourself a rear reversing camera will hopefully help to no end, especially when you turn up to the site after a long and traffic-filled journey, and there’s an audience of people watching you squeeze yourself into the last pitch available. One for the winter caravanners now, but a crucial one, nonetheless. Whilst it may sound extravagant, under carpet heating has proved to be a lifesaver and an all-round morale booster on those cold and windy days in the van. Easy to install, power and remove, there are plenty of choices for different heaters, just make sure you go with one that has good reviews! For those of us who can’t be doing with manoeuvring the van from the confines of our cars, why not step out, unhook your car and live out your childhood dream of owning and operating a remote-controlled caravan. Squeezing your van into the tightest of spaces just became a whole lot easier, if you’re storing your van in a narrow or crowded caravan park, then make sure you get yourself one of these because it could reduce so much stress. The best products in the market are probably from Towsure, so check out their website for more details. In a similar vein to the reversing camera, a rear mounted video recorder is a great little gadget to own. Dash-mounted cams have become more and more common recently, and a rear cam for your caravan is a good investment, especially when you consider caravans are more likely to be involved in accidents than your towing vehicle. Adding a cam will give you that little bit more peace-of-mind on those long journeys, and should the worst happen, and you were involved in an accident, then you’ll have all the footage ready to give to the authorities. For the more refined caravanner who can’t get out of bed without their shot of espresso, the ‘Handpresso’ is surely the gadget for you. Totally mobile, and sleek in design, this espresso machine will help even the most snobbish of coffee aficionados through the long days away from their bean grinders. If you’re safety conscience, then getting a top-quality caravan security clamp has to be high of your list of priorities. I’ll admit this one isn’t so much a gadget, but it could be the most important thing you buy on this list. When your caravan is in storage for the winter, or just between holidays in spring and summer, getting a security clamp is almost a pre-requisite to help keep you from waking up in the middle of the night worrying about whether your van will still be there when you get back to it. The Purpleline Nemesis is one of the toughest locks on the market, the 9-pin lock is from renowned manufacturers Lowe & Fletcher and will put you mind at ease, knowing if someone was attempting to take your van, my word they’ll be there for a while trying. 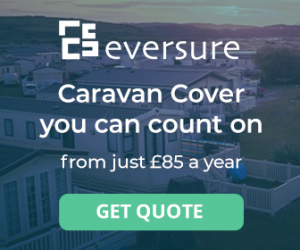 Eversure Insurance are specialist insurers who offer both touring and static caravan insurance. To find out more, head to their caravan insurance page to see if they’re right for you.